WOW! 70% OFF Compression Socks! 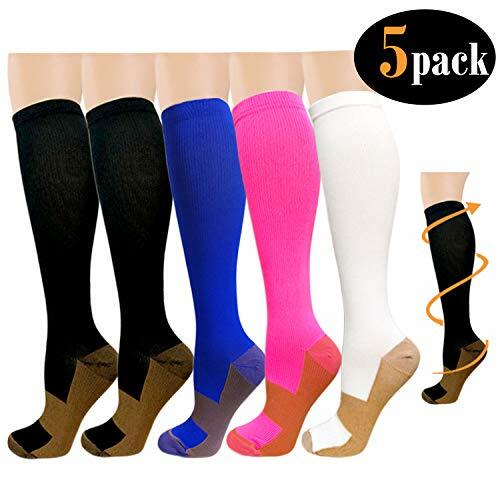 ONLY $5.99 for 5 Pairs + FREE Shipping on Amazon! Use coupon code: 70OKTC68 to grab these for just $5.10 (REG $13.99). ✅COPPER EMBEDDED COMPRESSION SOCKS-5 pairs of quality socks with unique color combination,it is perfect for 5 working days without daily wash, As you might know Copper is a great conductor of electricity. Through our socks, we are extending its natural property to rejuvenate blood circulation through your legs through copper fibers capable reviving blood circulation along with providing a 15-20 mmHg compression. ✅IMPERIAL COMFORT - Our compression socks (15-20 mmHg) are recommended by doctors and preferred by trainers. These compression socks are known to promote blood circulation and oxygen flow preventing cramping, swelling. Compression technologies also helps in muscle recovery, Improve venous blood flow. It aids in providing relief over varicose and spider veins. At the office or while flying, your legs remain light, painless and in comfort.